Souad* is a 5-year-old Syrian girl from Al-Raqqa. She fled Syria with her family 4 years ago when her neighbourhood was shelled. 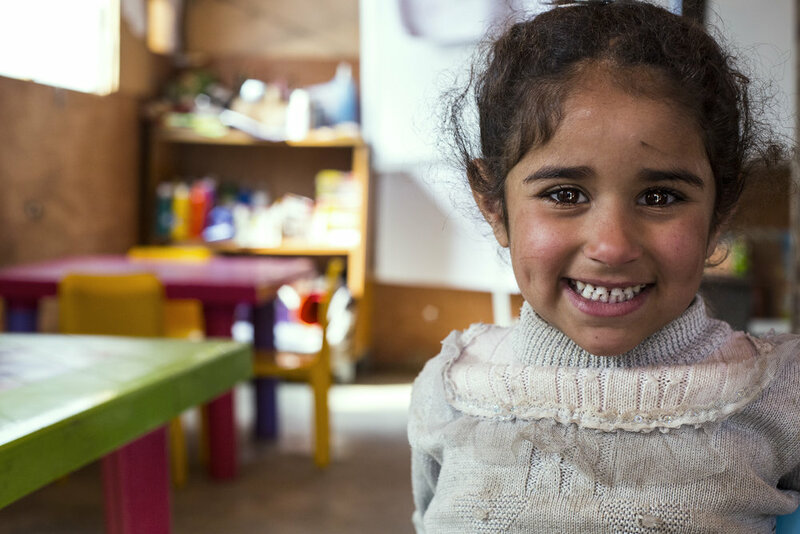 Souad* is now living with her family where she is enrolled in the early childhood development program run by Save the Children. For the youngest refugee children, the developmental and psychological consequences of forced displacement can be devastating. Without positive and supportive early childhood environments, the concentration of adversities faced by young children in crisis contexts can severely disrupt their development. Yet despite this understanding, early childhood development in humanitarian responses is hugely neglected. ‘Hands Up’ is an innovative two-year program delivered in two regions in Lebanon, focused on improving early childhood development provision for refugees aged 3 to 6 years old. Funded by the Asfari, Saïd and Hands Up Foundations, and delivered by Save the Children in coordination with local community groups, the program blends the teaching of key early math and literacy skills with the Healing and Education through the Arts program (HEART). HEART uses art, drama, and music activities to help children understand, express and communicate feelings related to stressful experiences in their lives – giving them back some of the childlike, carefree and fun behaviour children often lose in crisis contexts. The testimonies from this project are compelling, with caregivers and teachers commenting that children are able to manage their emotions and are better prepared for primary school. One teacher noted that Hands Up is a project “where independence, creativity and freedom of expression are prioritised alongside learning”. The project has a wider impact on the refugee community as many of the teachers on the program are Syrians, who are able to train, learn new skills, generate an income, and learn transferable skills that they can use when they return to Syria. Other aspects of this multi-faceted program include training parents on the positive role they can play in their children’s education and an innovative partnership with the Ministry of Education, funding a centralised information system, thus building its capacity for the long-term benefit of all children in Lebanon.